The Runelords all started with an ongoing series of novels by David Farland. A developer of properties for the gaming industry and a science fiction author (Star Wars: The Courtship of Princess Leia) under his real name, Dave Wolverton, Farland once again proves himself a wizard at storytelling in this third installment of his epic fantasy series, The Runelords. Against a medieval-like diorama, Farland has established a social system around the magical exchange of "endowments" from vassals to lords. A Runelord might have thousands of endowments, acquiring attributes (vision, strength, stamina, beauty, grace, wit) from willing donors, who become weakened Dedicates, crippled by the loss yet a Runelord must care for those who make his superhuman abilities possible. The Runelords: The Sum of All Men (1998) introduced Mystarrian prince Gaborn Val Orden, a Runelord who battled the powerfully endowed, near-invincible Wolf Lord Raj Ahten. With Gaborn newly crowned Earth King, defeated archvillain Ahten renewed his attacks in Brotherhood of the Wolf (2000). Now Ahten, Gaborn and Gaborn's wife, Iome, return to face the Reavers, huge monsters with "crystalline teeth like scythes" that pose a grim threat to Ahten's empire. In his role as "mankind's protector," Gaborn, despite dwindling powers, senses the impending doom of an all-out Reaver war, and Averan, a wizardborn girl with magical insights into Reaver consciousness, aids his hunt for the creature hordes. This latest is certain to summon past readers of the series back to bookstores. Continuing the fantasy saga he began with The Runelords, Farland's latest novel takes place immediately after its predecessor, and in the same quasi-medieval world. Earth King Gaborn and his rival, Raj Ahten, continue their deadly war until reaversAgruesome crab-shaped elephants with formidable magical powersAcompel them to join forces against a common enemy. Amid all the battles and intrigues, Farland explores the political and ethical dilemmas created by the rune system of magic, in which runes can transfer "endowments" of various qualities, such as glamour or wit, from one human to anotherAoften leaving the donor crippled or dead. In addition, Farland interweaves, with mixed success, several subplots, the best of which concerns the long journey of Averan, a nine-year-old girl who is traveling in the company of Baron Poll, Roland the Dedicate and a green-skinned wylde, a woman of potent magic able to literally eat a reaver for dinner. Also auspicious is the off-again, on-again courtship of the drunken Prince Celinor and the formidable Princess Erin. Farland's action-packed climax is gripping, even if it involves too much luck. 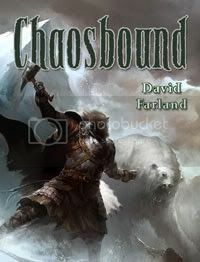 Though not yet in the first tier for narrative technique, world-building or characterization, Farland continues to show considerable promise, suggesting that his next novel may carry the Runelords to a yet higher level in the fantasy pantheon. Copyright 1999 Reed Business Information, Inc. —This text refers to an out of print or unavailable edition of this title. To atone for his misuse of the Earth's powers, Gaborn the Earth King sets out on a quest to find the Place of Bones. As giant creatures known as reavers continue to threaten the land, a young girl comes into her powers as one of the "wizardborn," holding in her memories the secrets of the reavers. The author's imaginative approach to magic, coupled with a richly detailed fantasy world and a cast of memorable heroes and villains, adds depth and variety to this epic tale of war and valor. Recommended, along with previous series titles (The Runelords, Brotherhood of the Wolf) for most fantasy collections. Copyright 2001 Reed Business Information, Inc. —This text refers to an out of print or unavailable edition of this title. Copyright © American Library Association. All rights reserved —This text refers to the Hardcover edition. The breathless third installment of Farland's second Runelords quartet opens with the cliffhanger from 2007's Sons of the Oak: flameweaver wizard Fallion Orden, son of the Earth King, is trapped by fiendish Lord Despair in a savage new world Fallion himself had made by melding two realities. Fallion has rejected endowments, transfers of power or skill that leave the donor drained of the attribute they bestow on the recipient, but his lover, Rhianna, her foster sister, warrior maiden Talon, and Talon's noble idol, the Emir Tuul Ra, accept numerous endowments, vowing to pay any price to rescue Fallion from Rugassa, where torture is an art. Oscillating between lurid depictions of blood-soaked vistas and heroic tales of noble adolescent saviors, Farland attempts to leaven the violence with enchanting parallel-world landscapes and charming minor characters, but the atmosphere overall is unrelentingly gloomy. Nonetheless, this series promises to continue as long as stalwart-stomached readers can keep turning its grisly pages. Scheduled to be released October 13, 2009.
enemies upon his own world… . The final book in the Runelords Series. Not yet released.